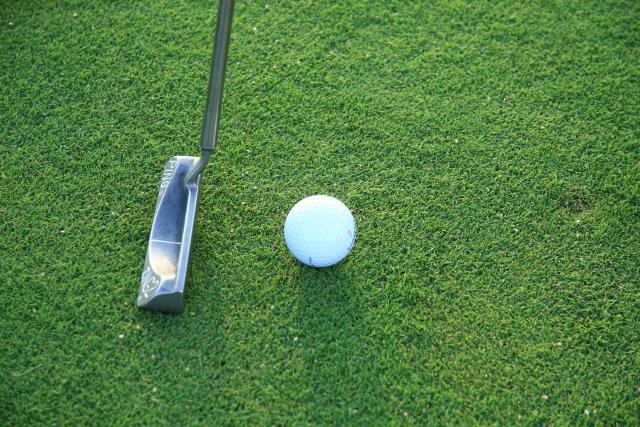 One of my very favorite summertime activities is miniature golf, and usually I have to wait until a beach vacation comes along to find a course. You can imagine my excitement when I found out my town had a miniature golf course only a few miles from my house. Naturally, I wasted no time in rounding up my family to give the course a whirl. The course was awesome and we had a great time, but even better was the valuable dataset I was able to get my hands on! Since beginning my Minitab career and becoming interested in statistics, I’ve found data collection is often the most challenging part in a data analysis project. However, this time I think I had more fun collecting the data than actually analyzing it. The course involved 18 holes, and a very impressive water stream throughout—making the possibility of losing a ball forever to the “raging rapids” very high for our group of amateur golfers. There were also sand traps and various obstacles that made it difficult to meet or score below par. There were five of us playing and final scores easily revealed one winner, but I wondered…are there any player trends to be aware of? Was the front nine or back nine most challenging for our group? 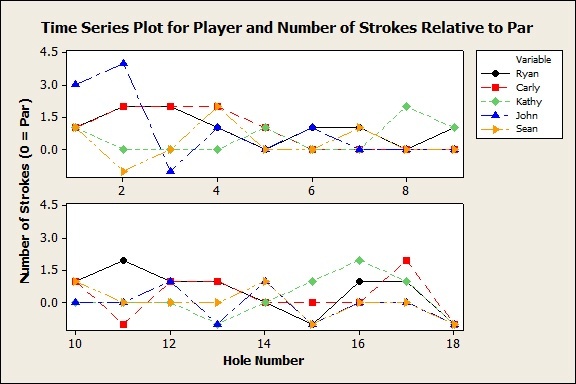 I wanted to look at player trends, so I chose to view the player strokes for each hole with a time series plot in Minitab (Graph > Time Series Plot and Editor > Panel to split the graphs into two 9-hole panels for easier reading). 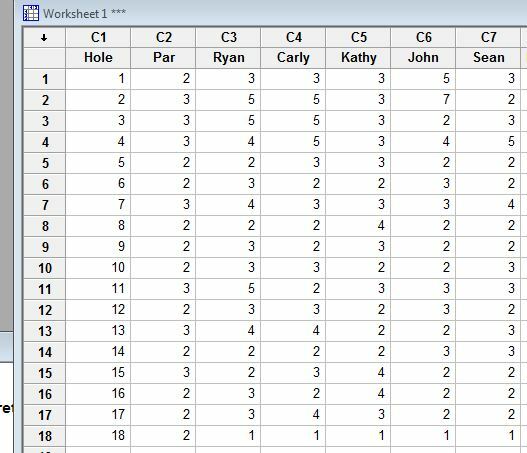 To get my data ready to plot, I used Minitab’s Calculator (Calc > Calculator) to take the difference of each player’s score and the par to get how many strokes over, under, or at par each player was for each hole. For example, you can see that the whole group was one under par, or birdie, at the last hole. For the first hole, you can see that I was one over par, or bogey. A zero means the player achieved par for that hole. Looking closely at the graph, you can see that John had the highest number of strokes above par and that those strokes occurred during the first few holes (it’s good that he got it out of the way early!). It’s also pretty evident that the group as a whole performed better during the back nine than during the front nine. Sean (in yellow) was the winner, and you can see that he had the most holes where he scored under or right at par. The mode, or the value occurring most frequently, reveals a lot in this case. Ryan and I had higher modes of 1 for the back nine, showing that our most common score for those nine holes was 1 over par. (I scored 0 and 1 each three times, so I actually had two modes.) 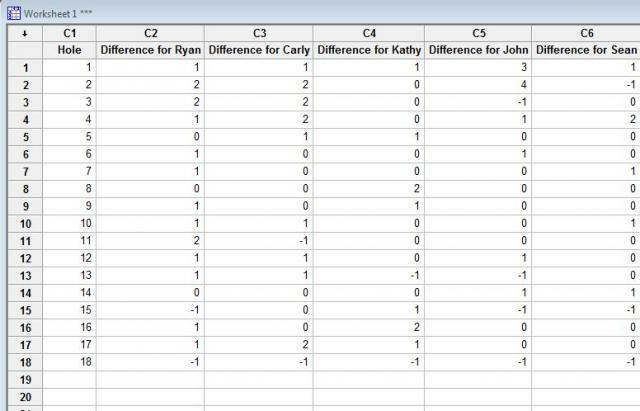 However, Sean, John, and Kathy all had modes of 0 for both the front and back nine—revealing they most commonly scored at par, and thus finished in the top three. 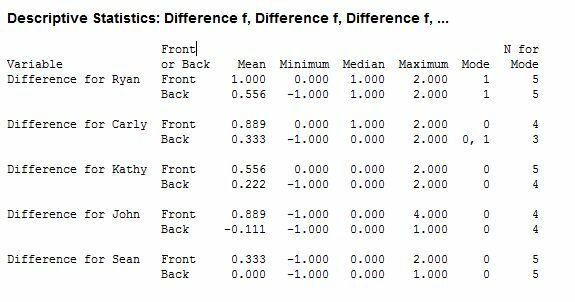 It’s also interesting to see the max and min number of strokes each player received in the back nine versus the front nine, as well as the mean. The means clearly display that we all struggled a bit more during the front nine in comparison to the back nine. 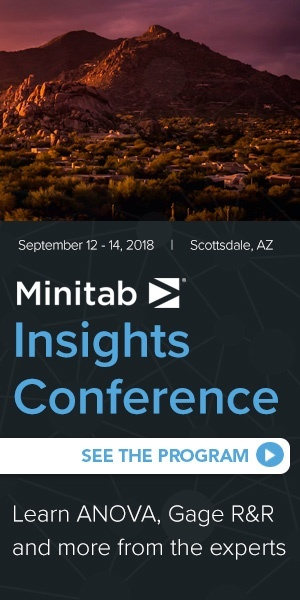 As much as I wish this were true, Minitab software was not named for its use in analyzing mini-golf stats, but got its name because it was originally developed back in 1972 as a “mini” version of the statistical analysis software Omnitab, a pioneering, high-level spreadsheet for statistical analysis on mainframe computers developed by the National Institute of Standards and Technology.